Ministry of Furniture, the company which emerged from Remploy Furniture in 2014, has expanded its offering by making a major six figure investment in Sign and Print Systems, a print and design company based in the Swansea Valley, which previously traded as BOW Design. Sign and Print Systems will rebrand as Ministry Graphics and operate as a subsidiary of Ministry of Furniture, which now holds a major stake in the business. The two businesses will share resources and premises both at the company’s head office on Baglan Energy Park, near Swansea, and in Ystalyfera in the Swansea Valley where the two companies operated from adjacent units prior to the deal. 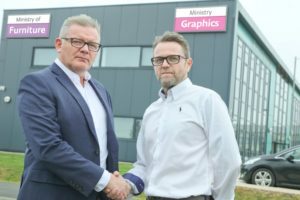 Ministry Graphics will continue to be run by Matthew Anderson, the former managing director of Sign and Print Systems, who himself acquired the company in September 2017. Anderson remains a shareholder in Ministry Graphics and will be responsible for driving the company forward. The two companies complement each other in terms of their offerings with modern Workplace, Education and Leisure space schemes increasingly requiring high quality design and print work; equally, many of Sign and Print Systems’ clients can now benefit from Ministry of Furniture’s interior design and project management expertise. Sign and Print Systems has invested heavily in new equipment in recent years including acquiring a Roland DG TrueVIS VG-640, a laminator and a CNC router, meaning Ministry Graphics will now be able to offer a bespoke, cutting-edge printing service. Both companies also have lucrative client bases. Ministry of Furniture, which turns over some £5 million, works with a wide range of high-profile clients across the UK. Sign and Print Systems also works with a number of blue-chip clients nationally. “The two companies complement each other perfectly. Ministry of Furniture is cutting edge in terms of the learning space and workplace solutions it creates and we can complement that perfectly. Equally, this gives us a solid platform from which to continue to grow the business significantly. “This is our first acquisition at what is an exciting time for the company. We have grown steadily since our launch and we are delighted to have reached the £5 million turnover mark in our fifth year of operation. That gives us a fantastic base from which to further expand our offering and this deal does exactly that.